Special edition Eagles Championship wine is available starting this month. For those of us who aren't quite ready to stop celebrating the Philadelphia Eagles Super Bowl LII victory yet, here's a new reason to never stop never stopping: the dawn of Philadelphia Eagles wine. 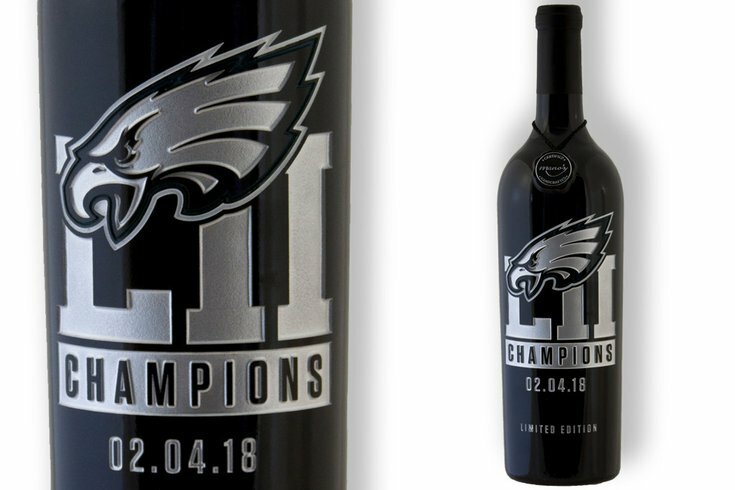 This week the Pennsylvania Liquor Control Board announced handcrafted bottles of Philadelphia Eagles Championship Red wine was headed for shelves at select Fine Wine & Good Spirits stores, commemorating that fateful day in February. The wine itself is a blend of Central Coast Cabernet Sauvignon and Monterey Merlot, aged for 15 months in French and American Oak for a Bordeaux-style blend. If you're not exactly a wine connoisseur, this stuff will be going for much more than a box of Franzia: the Eagles wine retails for $49.99. Though the wine has a limited distribution, there are a handful of Philadelphia locations carrying the 750mL bottles. As of Wednesday morning, the Fine Wine & Good Spirits stores on South Street, Point Breeze Avenue, and Washington Avenue each have 24 units. Stores throughout Delaware, Montgomery, Chester, Lancaster, and Bucks counties are listed as having the bottles in stock as well. You can check out specific locations' stock status here.